By launching your website on the flexible AWS Cloud you can deploy your website in minutes. With AWS and Vinsinfo Pvt. Ltd you can provision the resources you need to keep your website running smoothly. Get faster time to market and reduce infrastructure costs by eliminating server management. The cloud is the foundation for establishing a more agile, innovative organization. Migrating your on-premises or co-location workloads to the cloud is not a question of if, but when and how fast. Organizations using a DevOps model deliver applications quicker and innovate faster. AWS offers infrastructure resources designed to support continuous integration and delivery, infrastructure as code, microservices and monitoring & logging. Amazon Web Services offers reliable, scalable and inexpensive cloud computing services for Windows Server that can enable you to reduce TCO and maximize your benefits including agility and security. The flexibility and scalability of AWS enables you to create as many Virtual Private Clouds (VPCs) as you need and provides a variety of connectivity options to meet your networking requirements. Use Amazon Web Services to easily deliver mobile apps that can improve engagement with your customers. Organizations delivering mobile apps are meeting customer needs head on, giving them a competitive advantage. AWS and Vinsinfo Pvt. Ltd can help you get started building mobile apps quickly, driving your business forward in this mobile-first world. The AWS Managed Service Program leverages a rigorous validation process to identify and recognize Next-Generation Managed Services Providers (MSPs) who have a deep expertise across AWS. As a Next-Gen MSP, we can use our expertise to provide guidance to organizations like yours throughout your entire customer engagement lifecycle. Migrating your applications to the AWS Cloud gives you access to on-demand IT resources designed to help you innovate faster, reduce costs and operate more securely. Based in Netherlands is a world leading provider of knowledge solutions for the food and beverage industry. The Application and Database was running on a single DB server and the secondary server was in standby mode. Elasticsearch engine was used for free text search, which was hosted in a single server with limited scalability that made the server crash and had to be rebooted frequently. The application involves image processing tasks, resulting in high CPU and memory utilization. Hosted on a dedicated host, the storage and backups was very expensive. After evaluating available cloud options, we provided AWS solution which was significant with cost optimization and increase in performance. By our analysis, it was identified that 50% of data was not frequently accessed. Hence the database on MS SQL was moved to PostgreSQL and hosted on Amazon RDS. The remaining 50% of frequently accessed database was hosted on MS SQL for high availability. The Elasticsearch clusters were configured in 18 Amazon EC2 virtual machines, thereby giving room for scalability as and when required. The image processing tasks was handled through AWS Serverless Architecture concept using the Lambda, SQS & S3 services. AWS Lambda helps in processing millions of images stored in S3 buckets without affecting the application performance. 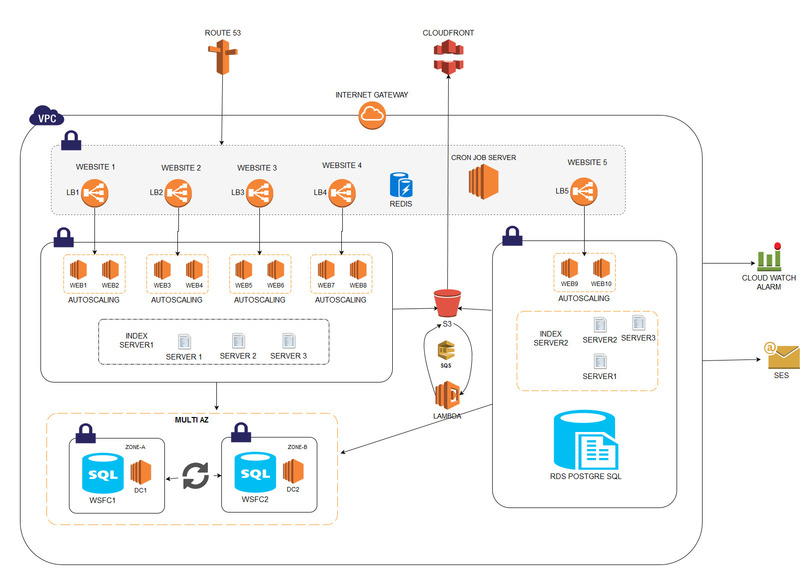 The user sessions state were processed by 2 nodes of AWS ElasticCache Redis cluster and the load due to all the applications, database and application services was handled through a Load Balancer. The usage of Amazon S3 along with Amazon Glacier storage for archives reduced the storage cost by 80%. The CloudFront Edge caching helped in content delivery with low latency and high transfer speeds throughout the world. The database split led to high availability and increase in performance making it easier to handle traffic. Significant reduction in effort to manually set up and upgrade servers due to increase in traffic. The maintenance downtime is reduced with no data loss and 99.99999999999% uptime. The cost savings is about 40% annually when compared to dedicated hosting.